When your teeth and gums are healthy, your gums hug your teeth tightly, but when you suffer from gum disease the bones and tissue get destroyed and pockets begin to form around the teeth. As time goes by and if left untreated, the pockets grow bigger allowing more bacteria to develop inside of them, which leads to even more tissue and bone loss. This can lead to tooth loss. It is important to have good dental hygiene habits and keep your regular checkups, to avoid any serious problems with your gums. Can Gingival Pockets be Reduced? During the examination to determine treatment, our periodontist will measure the depth of your pockets with a special tool by gently probing around each tooth. He will order a periodontal pocket reduction, because the condition cannot be fixed with a professional cleaning or at home. How Does a Periodontal Pocket Reduction Work? 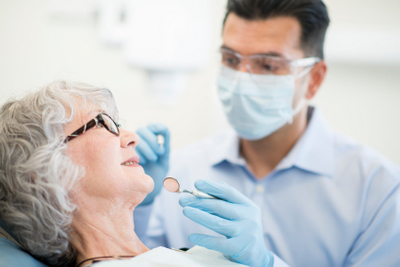 During this procedure, your gums get folded back allowing access to the affected area. The disease-causing bacteria is removed, and the gum tissue is put back in place. If there are irregular surfaces of the bone that are damaged, they get smoothed out so that the gum tissue can adhere better to the teeth. Reducing gingival pockets is important to prevent periodontal disease from progressing and damaging more tissue and bone. This procedure will result in reduced gingival pockets and healthier gums, which will result in a healthier smile. Because the deeper pockets are more difficult to clean, we recommend you practice good oral hygiene at home and get professional cleaning regularly. A water flosser equipped with a special tip for the pockets can be helpful in preventing the progression of gum disease. If you have any questions about what you can do to stop the progression of gingivitis and periodontal disease, please don't hesitate to ask.